Designed by denim blogger, photographer and collector, The Denim Hound for Kojima Genes x SF, and 100% made in Kojima, Okayama, Japan. This collaboration has been in the works for over a year, and was created with the top-shelf denim lover in mind. KOJIMA GENES was born in 1996 with respect towards the artisans in Kojima, carrying on the legacy of quintessential Japanese denim. 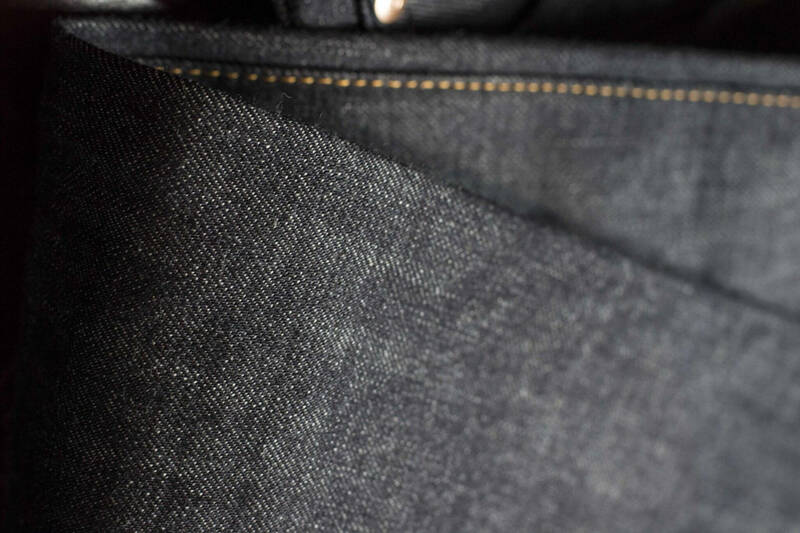 Shouldering generations of artisans in Kojima, where Japanese denim originated, to create top quality denim offering unpretentious, yet essential collections to denim lovers. All of our products are proudly handcrafted in Kojima. In 2014, the KOJIMA GENES x SF project was started with one vision: Bringing the story of “Made in Kojima” denim to people of every corner in the world. 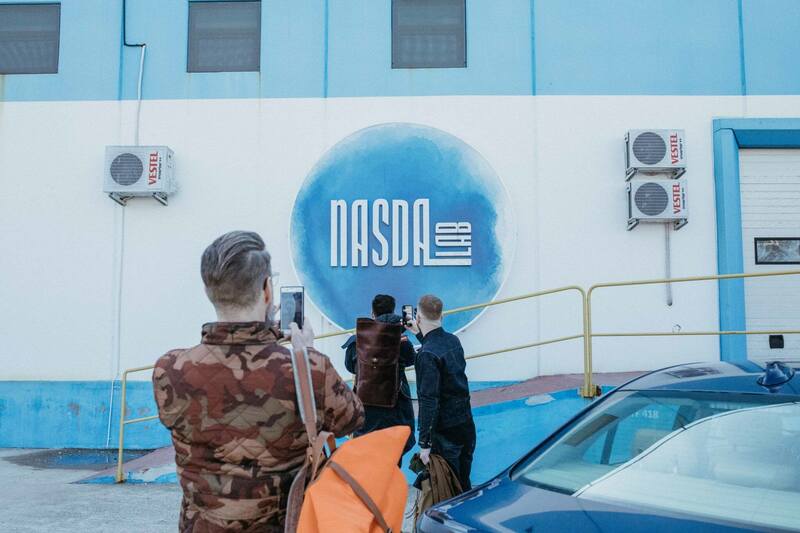 We want to achieve this by creating crowdfunding campaigns and collaborating with influencers, just like with The Denim Hound and the Bridge 1 Jeans. We all work hard together with a jolly spirit and hope you feel that when you wear our products. We believe that “GOOD GENES MAKE GOOD JEANS”. I am half Japanese and half Irish, born and raised in California, so I’ve always been interested in how cultures can effect and influence each other. Being both Japanese and American, I’m fascinated by how denim is a bridge between the two cultures. I wanted the Bridge 1 jeans to honor the relationship of Japanese and American cultures. I think working with Kojima Genes x SF was the perfect collaboration for this concept. I’ve been collecting jeans for years and have had close to 200 pairs at one point. I’ve done detailed reviews on almost 100 pairs for thedenimhound.com. I’ve basically been studying everything I can about denim fabric and the constriction of jeans. For my first collaboration and first chance to design a pair from the ground up, I wanted this pair to be special. I’ve pulled from my experience with denim to create a pair of jeans of the highest quality, with all of the details I look for, without overdoing it and ruining a clean and sharp aesthetic. 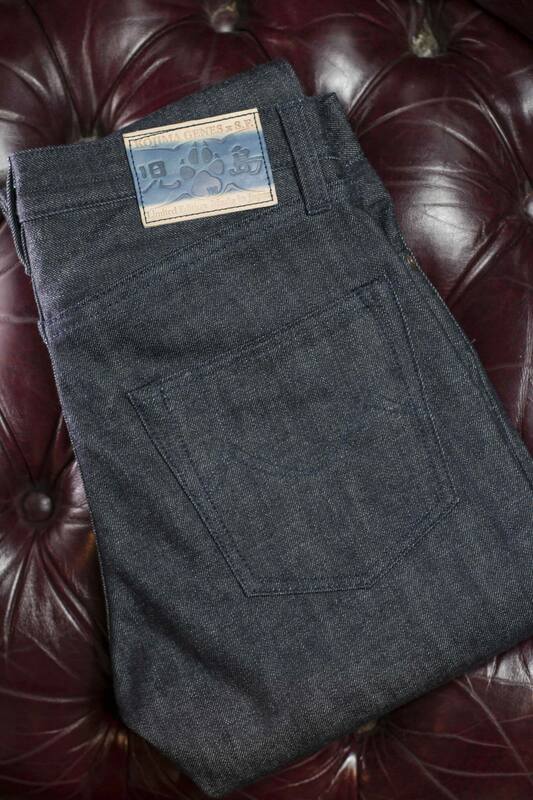 I also had to make this pair with an interesting denim with great character… and sick fades! 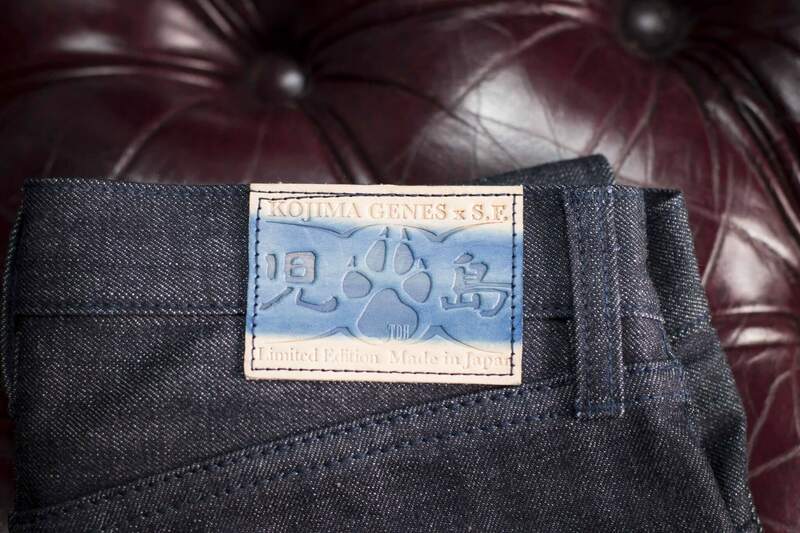 Working with Kojima Genes x SF has been very exciting and one thing we both wanted for this collaboration is that the final cost of the jeans would be kept down and would be an amazing value for the price. It was a challenge to get all of the details I look for in a high end pair of jeans, and keep the price down. In the end, I’m very happy with the result. An exclusive 13 oz. 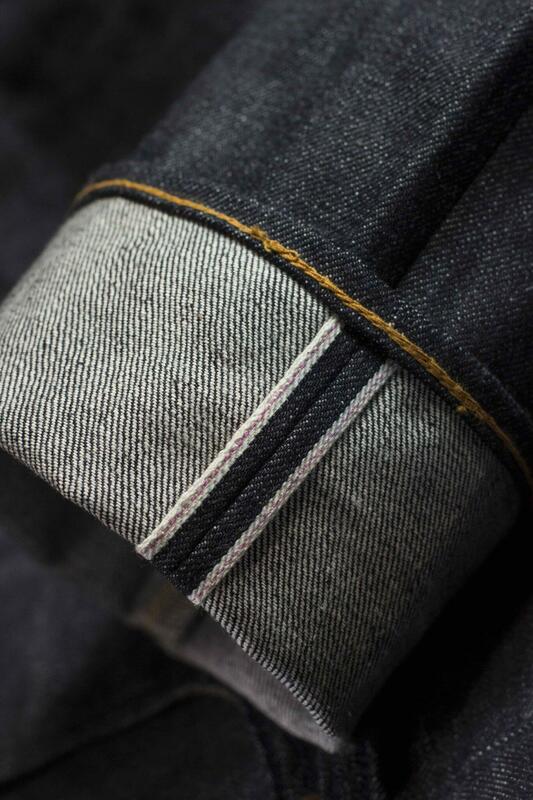 100% cotton denim from Kuroki Mill which will only be used for this collaboration. 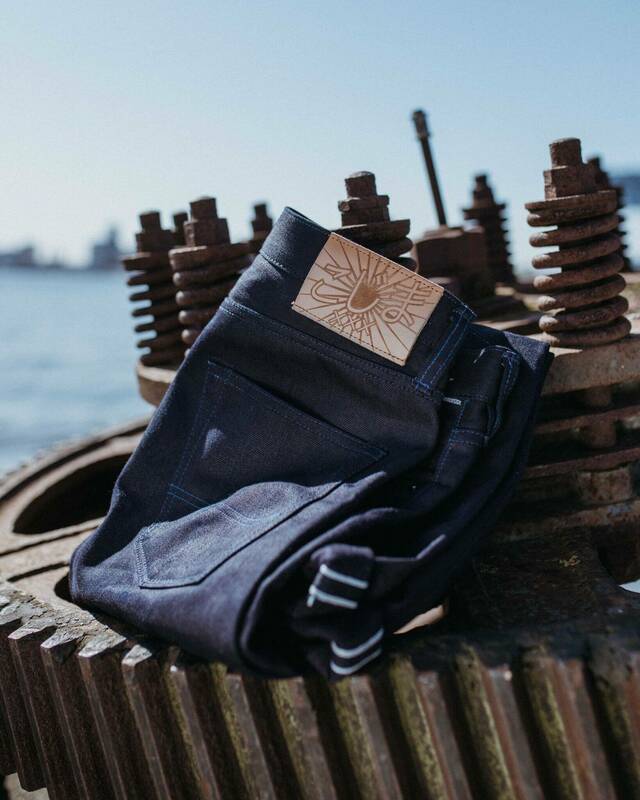 A middleweight denim that is durable while being wearable most anywhere in the world, all year round. 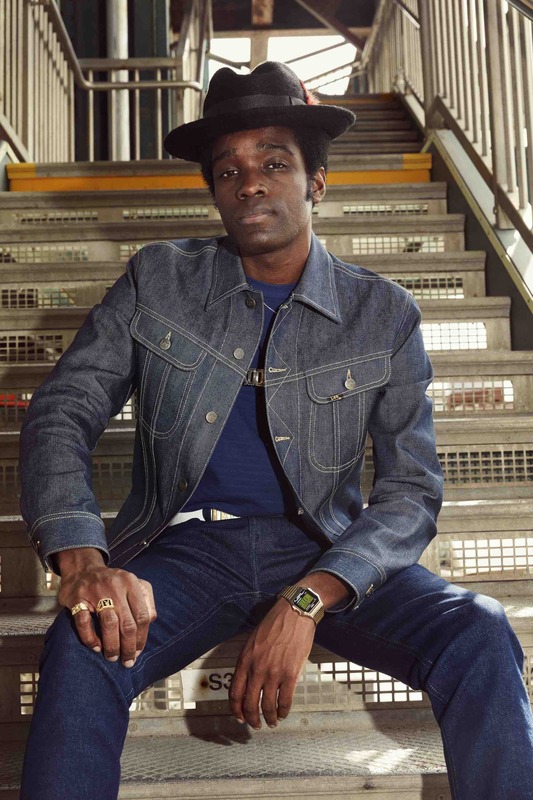 Low tension ring spun yarns are woven with a tighter weave to give extra strength to the denim. 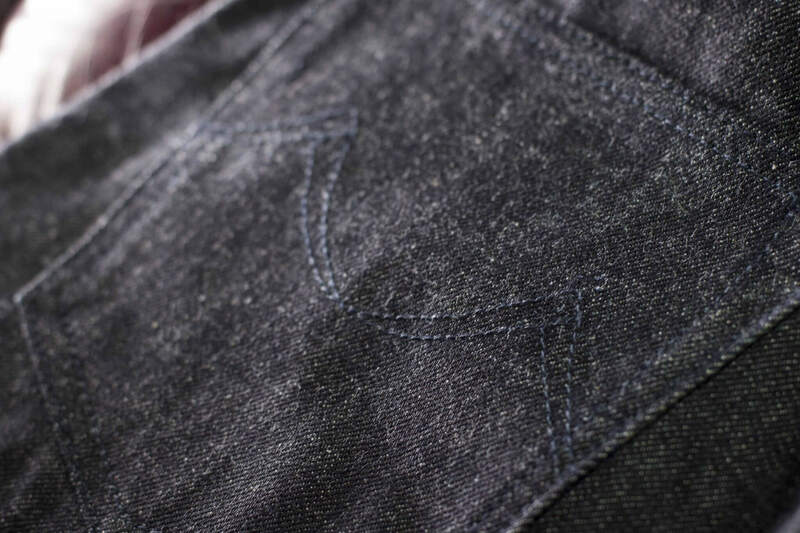 The denim is dyed with a very dark shade of pure indigo. It is dyed quickly and dried for longer periods between soaks to allow more oxidizing and darker color with less dips, so the core of the yarn stays as white as possible. This makes for very fast, high contrast fading. There is a nice uneven texture to this denim with light slub yarns in the warp and weft. The denim is sanforized so you can buy true to size, wear raw without soaking first, and not worry about shrinkage down the road. This will lead to some incredible fades. It’s an honor having Isaac from Pigeon Tree Crafting hand make every patch for this collaboration. I wanted to do something special for this patch so I worked with Isaac to develop a new dying method I call the ‘Taco Dip’. Each patch is hand cut and stamped in 5oz Premium Brazilian vegtan leather. Then the patch is bent like a taco and hand dipped in pure indigo. This process is very time consuming as each patch has to be carefully dipped one at a time, instead of all at once. The patina of the raw vegtan and indigo leather as they age side by side, will be beautiful. 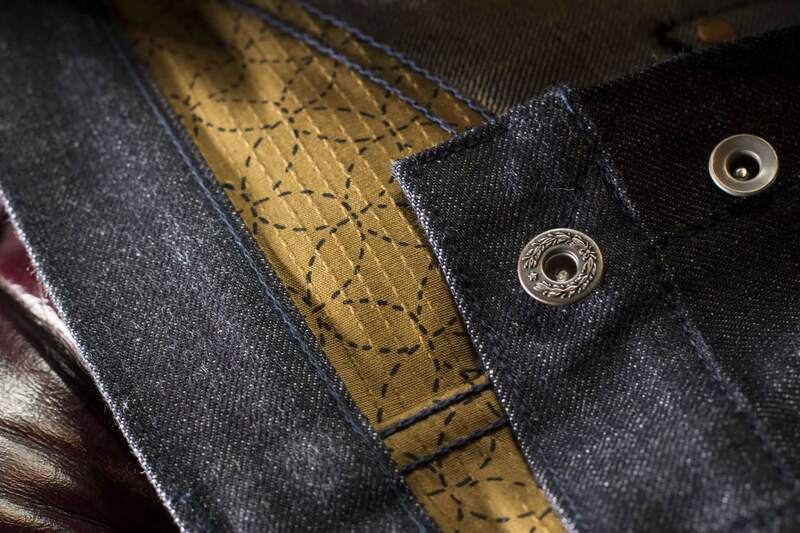 Another detail that makes this a special piece for denim collectors. The pocket arc was designed to represent the connection between Golden Gate bridge in San Francisco and its sister, the Great Seto Bridge in Kojima, Okayama. 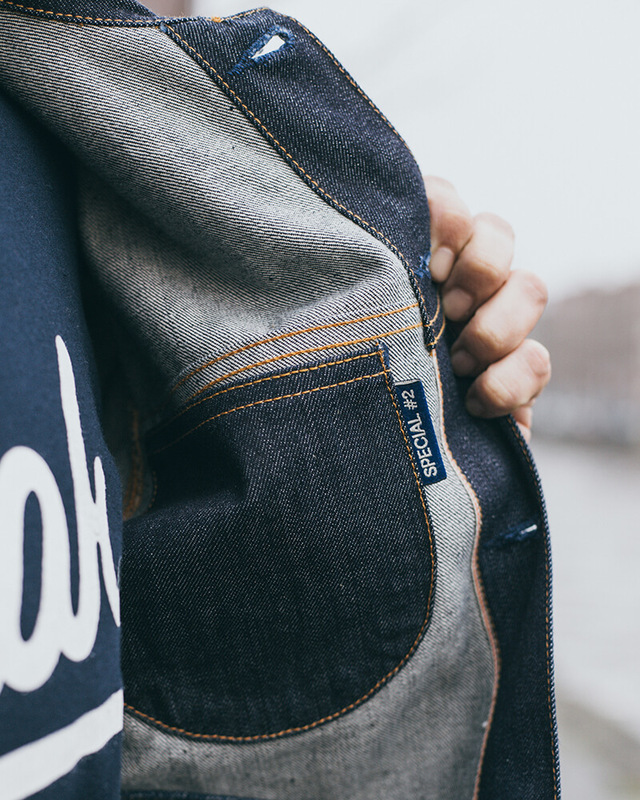 Tonal navy stitching was used so that the arcs would appear slowly over time as the denim fades. The sashiko fabric used on the yolk and pocket bags is just beautiful. Having a lined yolk is a luxury detail not many jeans have. It looks amazing in my opinion, and it gives the yolk another layer that pops through you get any holes down the road. 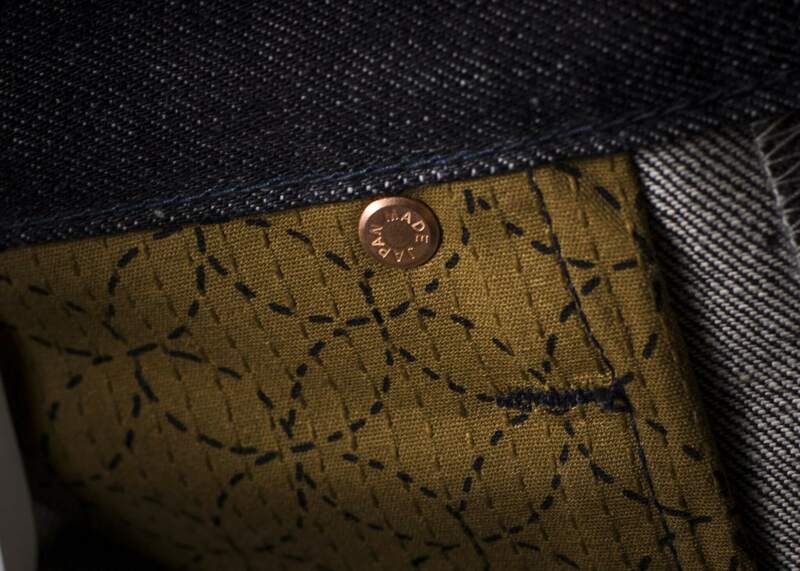 The copper color of the fabric is echoed across the jeans in the rivets and copper threading on the inseam. The Japanese pattern used is called Shippou 七宝 , it refers to the seven treasures of Buddhism: gold, silver, lapis lazuli, agate, seashell, amber, and coral. All of these are found on the Asian continent and were precious and rare products. This pattern represents these beautiful seven treasures inlaid in metal, in an infinitely repeating pattern. Flush copper rivets with ‘Japan Made’ branded on the tack side. These rivets wont scuff up your leather bags or scratch your guitar, etc. 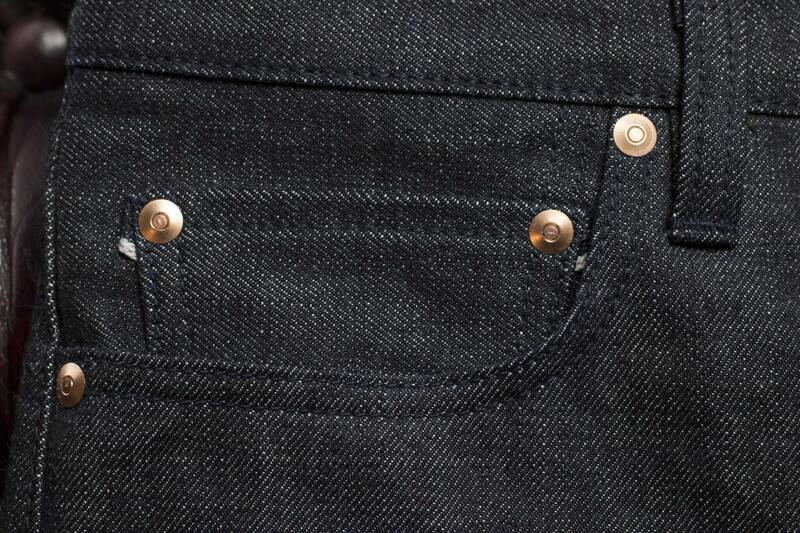 Hidden rivets on back pockets. This makes the loops more reliable and gives the jeans a cleaner look. I like to wear a key hook on my belt loop. With belt loops that are not tucked. The rope inserted, rasied belt loops keeps the friction point away from the stitching and focuses it in the center of the loop. This not only makes for a longer lasting belt loop but it also creates a nice fade surface. This color represents Coral, one of the “Seven Treasures”, which lyes hidden under the waters of a bridge. 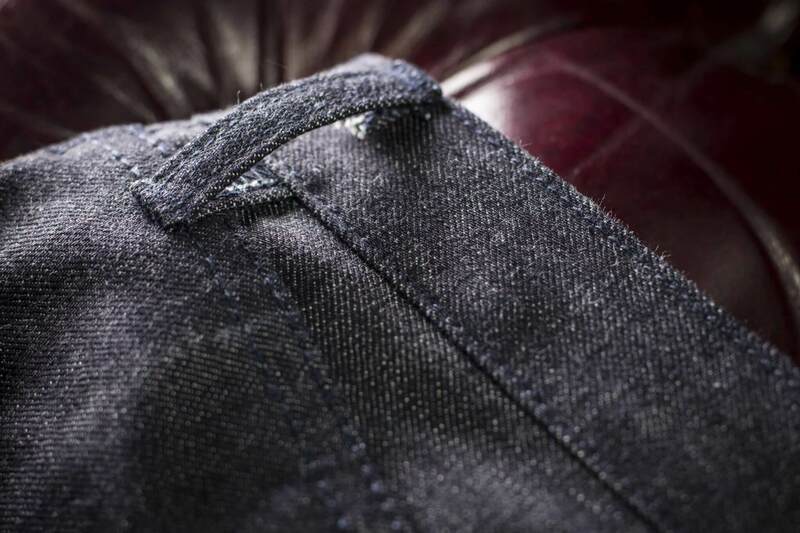 Just as the selvedge ID is hidden just under the surface of the denim. Preorder now for a very limited time at ATRIUM SF.